Firstly, as blows in full-contact are not ‘pulled’, the fighting is much harder. Consequently, armour needs to be tougher. As the fights are competitive, rather than for display purposes, a fighters armour needs to fit him/her well, and allow him/her maximum mobility. When choosing your armour, you should bear this in mind. Secondly, since we are not intending to portray a sort of ‘snapshot of history’, like a re-enactment group, each member can choose to adopt armour from a different time period and geographical region. Thus, on the same team, armour may stretch over four hundred years, and the whole world. However, each fighters whole kit must match as to time and place, within 50 years. Mild steel: cheap but heavy. Easy to repair by knocking dents out, but will require a lot of panel-beating as it will dent frequently. Mild steel is often regarded as the ‘baseline metal’, to which other metals are compared. 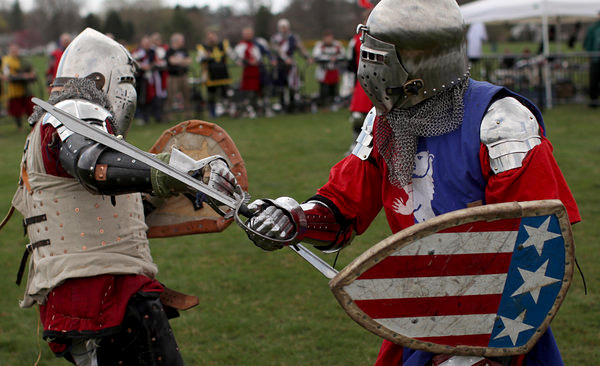 Spring steel: armour can be made thinner, therefore lighter, than with mild steel. It is harder, so it does not dent as much as mild steel – the disadvantage of this is that it cracks instead, which can be difficult or impossible to repair. So while you will not need to spend the time beating out the dents, if it breaks, it may mean buying new. Spring steel armour is also more expensive than mild steel. Stainless steel: armour is heavier than with mild steel, but harder (so no/fewer dents, like spring steel), so you get a very durable armour that does not rust so quickly (so less time spent in maintenance) but it is heavier. This is likely to be very important for smaller, lighter fighters. Titanium: this is the metal of choice for many of the top Eastern European fighters as it is tough and light. It is also very expensive. Titanium use is varied across the different international tournaments, so bear this in mind. Before buying anything you should take the time to explore what is available, talk to more experienced fighters, and if you can, borrow some equipment to see how it looks and feels in real life. Only then can you make a decision regarding what equipment you want, and what materials you want. Your first decision is therefore one of time period and geography. 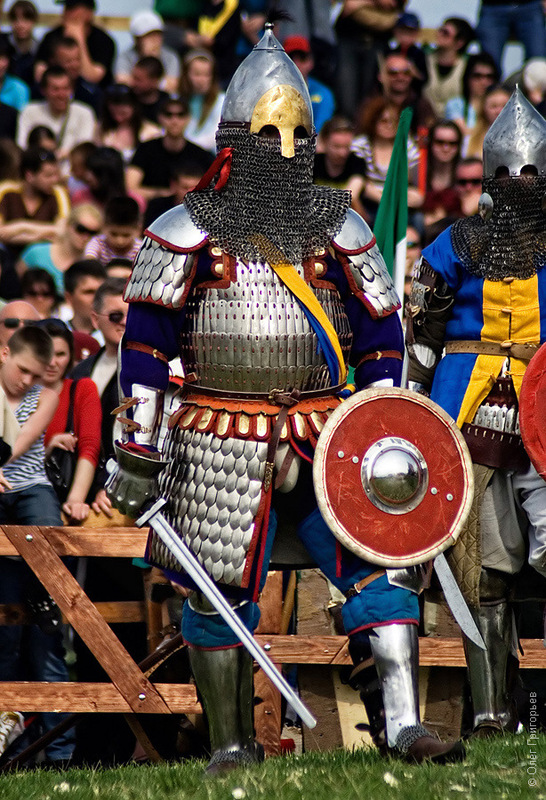 Most fighters default to the period 1340-1420 since this transitional period armour provides the fight combination of protection, lightness and mobility. This picture shows one of the most common armour sets at BoTN. Mostly It’s a variation on the theme of klapvisor bascinet, coat of plate and splinted arm and leg defences. It provides probably the best combination of protection and mobility. This type of armour set dates from roughtly 1350-1380. Post-1420 you hit the era of full plate armour. Looks good and provides superb protection but weighs you down and slows you down no matter how fit you are. i) helmet has superb visibility. ii) If ordered in spring steel it’s incredibly light and manoeuvrable. This is sometimes referred to as ‘transitional armour’. This covers the period 1380-1420. The classic helmet for this period is the ‘hounskull’ bascinet.